BOGOTA, Colombia, March 2018 – Last week in Sydney Harbour, our Business Development manager, Oliver Houlcroft, met with Jairo Hernandez, Ambassador of Costa Rica to the Commonwealth of Australia. 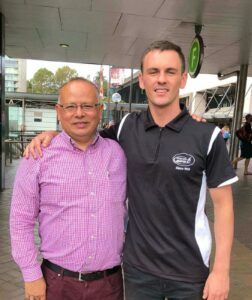 Our Business Development manager, Oliver Houlcroft with Jairo Hernandez, Ambassador of Costa Rica to the Commonwealth of Australia. Whilst back visiting his native Australia, Oliver took the opportunity to meet the ambassador in person. As well as discussing Biz Latin Hub’s role in bringing business to LATAM, the pair shared views on issues such as Central America’s flourishing industries, the growing investor interest in the region and Australia-Latin America relations. “I am very confident that across the Pacific Ocean, the relationship between Australia and Latin America will continue to evolve positively, reflecting the mutual interest in advancing a strong partnership between two dynamic regions. Small, medium and large countries in Latin America are committed to vigorous links with Australia, definitely considered one of the strategic gateways to the vast Asia Pacific region.” – Jairo Hernandez, Ambassador of Costa Rica to the Commonwealth of Australia. Oliver had previously reached out to the ambassador in 2017 to draw on his expertise of the Central American region for an article produced by the Biz Latin Hub group. The article focuses on commerce and economics in Central America, whilst giving special attention to Costa Rica, and examines a range of external and internal factors that affect investment and investor confidence in the region. Over the past 18 months, Jairo Hernandez has been in regular contact with Mr. Craig Dempsey, CEO of Biz Latin Hub, and has shown much support for the Biz Latin Hub group for which we are greatly appreciative.